Today I'm excited to bring you 3 of the hottest neutrals to hit the wedding scene since the color black. When it comes to styling your wedding, neutral colors offer a multitude of ways to add personality to your wedding decor, proving that neutrals are anything but dull. Soft hues, such as beige, khaki, and rain-cloud gray, create a calming atmosphere, while the contrast of a gold and white color scheme introduces elegance and flair. Go bold with splashes of rich neutrals, such as chocolate brown or slate gray, or go sleek and subtle with a tone-on-tone white look. The choice is yours! If you're are looking to pick the perfect neutral color, visit our full palette of colors here, where you can try out different combinations and pairings. Want to know the 3 hottest neutrals in weddings right now? Behold, the prettiest (and most popular) neutrals in weddings! 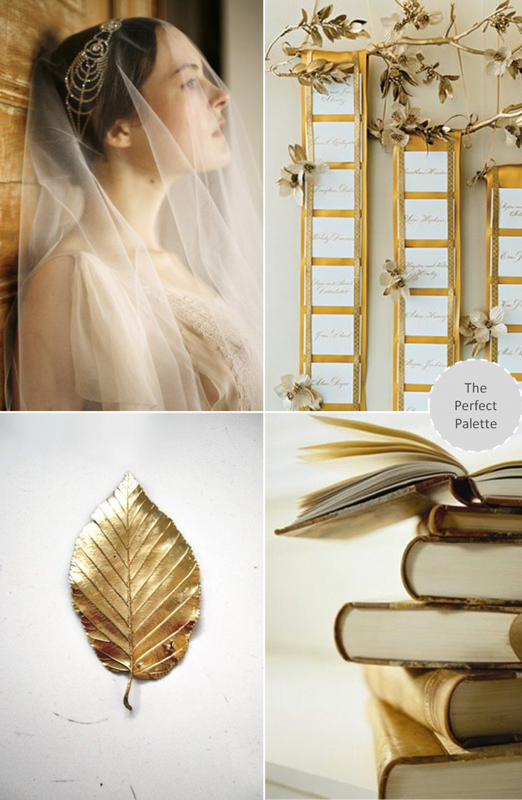 Gold is arguably the most popular neutral in weddings right now. It's metallic quality really makes it feel special. And for that reason, we're seeing more and more couples choose to add elements of gold to their wedding days. I like gold because it's easy to incorporate a vintage inspired theme and it adds a bit of "fancy" to any affair. Gray, also a huge color for weddings right now, has taken the wedding industry by storm. More and more often we're seeing grooms and groomsmen dressed in gray suits instead of classic black. And we're also seeing more and more brides selecting gray for their bridesmaid dresses as well. Overall, it's a color that has continued to grow in popularity. And it's easy to see why! Brown became really popular in weddings a few years back (with a huge peak in 2007 - 2009). I remember when I was planning our wedding, brown was the "it" color for neutrals. We were seeing brown bridesmaid dresses pop up everywhere, and it was used often to communicate that rustic flair we've all grown to know and love. So what do you think? Are you liking the way these neutrals have been used in the weddings you've seen here lately? Whether you decide to pair your neutrals with a bright hue or more subdued shades, one thing is for sure - you can't go wrong with nice neutrals like these. I even happen to think that monochromatic palettes like these work well. What do you think? And which neutral is your favorite? 12 Comments " Top 3 Hottest Wedding Neutrals "
Love these colors. I think gray is my favorite. Although all three paired together would look great too! I'm digging on all of these, but I have to agree with Krisstin! For some reason I have always loved gray for weddings and you picked such gorgeous, ethereal examples! Love love all of these! Agree with Krisstin and Ariana, love the grays so much! I have always been a sucker for neutrals and you picked some gorgeous, compelling reasons why I will stay that way. I love the grey but the gold and brown neutrals are my absolute favourites! Dreamy! Loving the gold the best !! Gold goddess and gorgeous gray...love! Love this - neutrals will forever be my favorites! Love gray and gold so much already, but you've also sold me on brown for sure! You've shown how beautiful it can be! You can never go wrong with neutrals! Love this modern take on neutrals. I particularly love the gold goddess board!